This is the system in my own audio equipped ride. The main box is the size of a cigarette pack and has physical connections to helmet headsets, MP3 players, cell phones, communication radios, and other audio sources. Photo by Wayne Roth. In this edition I’ll discuss wired rider intercoms and their modern wireless counterparts. Sound and intercom systems have become more capable, easier to install and use, and more affordable. I use a wired intercom with an MP3 player or satellite radio for music. When I am riding with a passenger, a second headset allows both of us to talk and enjoy the music. For those times when I want to stay in touch with others, I connect a two-way radio or my cell phone. 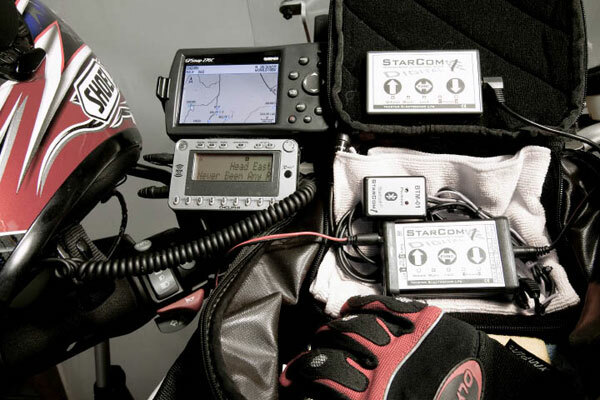 The system is manufactured by Starcom1 Bike Communications. The main box is the size of a cigarette pack and has physical connections to helmet headsets, MP3 players, cell phones, communication radios, and other audio sources. The latest offering is digitally controlled and adjusts the sound level to compensate for ambient noise. An optional Bluetooth device replaces the hard-wired connection to a compatible cell phone. Other accessories include a handlebar-mounted volume control and a remote control pad. Since I’m always switching to different bikes, I keep the components and associated cables in a small zippered bag that I toss into my tank bag. A power wire plugs into the bike’s accessory power connector, and coiled headphone extensions link the helmet headsets. On group rides, I connect a two-way radio. If I’m feeling the impulse for even more audio gadgets, yet another wire snakes out of the bag to a radar detector or GPS voice navigator. Citizens Band (CB) radios remain a popular choice for long range bike-to-bike communication. The radios can range several miles, thanks to their 5 watt transmit power, but a big antenna is typically required. Another problem is that CB radios are susceptible to interference from far-away signals. The Federal Communications Commission (FCC) has created the Family Radio Service (FRS) and General Mobile Radio Service (GMRS), in part, to eliminate static from distant stations. FRS is limited to ½ watt transmit power and has a shorter range than the more powerful 5-watt GMRS. The GMRS radios are more expensive and require an $85 license. 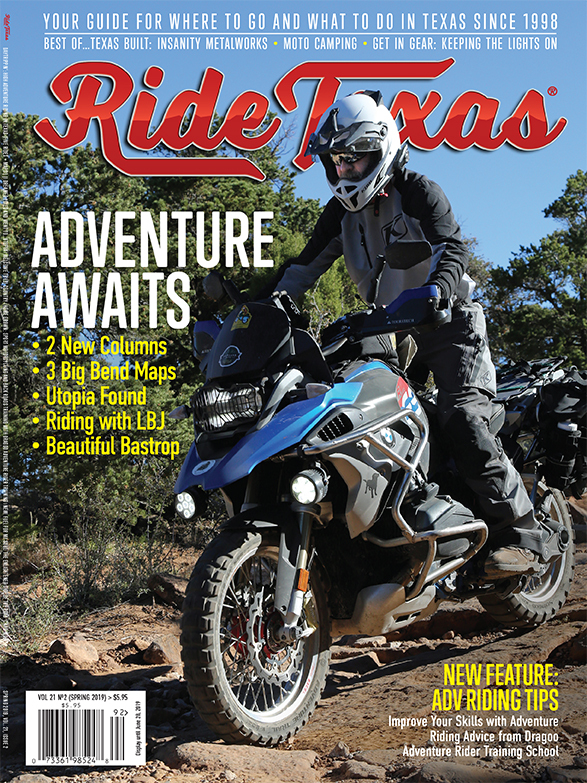 FRS equipped bikers can talk with GMRS users on any vendor’s radio on certain channels. Careful placement of antennas and electrical connections can help improve communications range and clarity. To extend the range of FRS/GMRS radios, keep the antenna away from metal bike parts. Multiple audio sources wired into an intercom can create a “ground loop.” You’ll know you have a ground loop if you hear a whine that changes pitch with engine speed. This is caused by multiple electrical paths to the motorcycle’s ground and can be solved by inserting a ground loop isolator between the audio source and intercom. If you tie in a battery powered device, such as an MP3 player, there’s no connection to ground, and an isolator isn’t necessary. 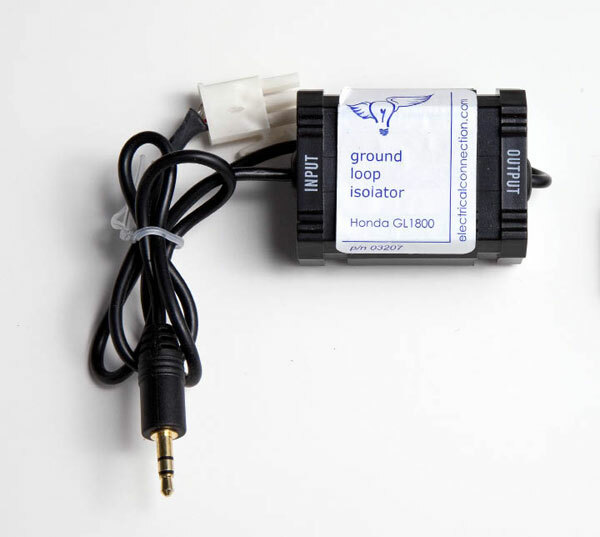 Multiple audio sources wired into an intercom can create a “ground loop.” The Problem can be solved by inserting a ground loop isolator, like this one. Photo by Wayne Roth. While Bluetooth intercoms have been around for years, the user experience has not always been great. The headsets were expensive, difficult to set up, and the bike-to-bike range was measured in hundreds of feet. The advantage of Bluetooth systems is that a single headset integrates the functions of a wired system into a very compact, self-contained package. Now that the cost has dropped and many of these problems have been solved, Bluetooth intercoms offer a viable alternative. Systems are typically sold in pairs, but can also be purchased singly. In addition to their core function as rider-to-rider intercoms, all of these units can pair to a cell phone, GPS, and a music source. As a general rule, inter-manufacturer pairing is difficult to get working, if not impossible, so check with your riding buddies before plunking down money on a given brand. A Bluetooth “service profile” is the type of pairing (connection) made from the headset to an external device. There are two major profiles to be concerned with: A2DP and HSP. A2DP is used to transmit music, whereas HSP (sometimes called HFP) is for voice-only connections. Most modern smartphones provide both A2DP and HSP services, providing the ability to receive phone calls, listen to music, and even hear GPS navigation commands. 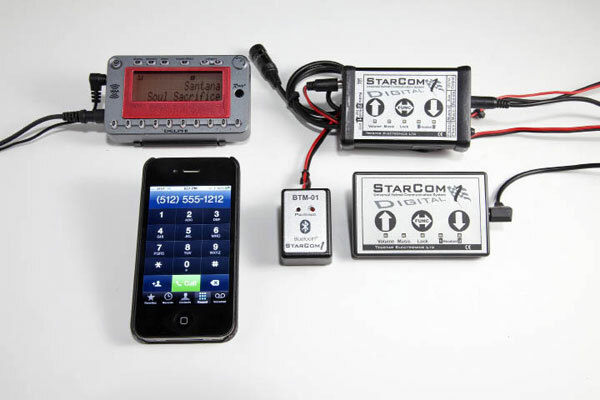 The Starcom system. Photo by Wayne Roth. There are a variety of Bluetooth systems specifically designed for motorcycle riders. The systems range in price, depending on features, from $199 to over $500. At the high end of the scale, the Interphone F5 understands voice commands, will read caller ID from your phone, and allows up to 6 riders to conference simultaneously at over a mile apart. The Cardo Scala Rider G9 can pair up to 9 riders, but only 4 can talk simultaneously. Possibly the best bang for the buck, the Sena SMH10 can conference 4 riders, has simpler controls, and will span a little over a half mile range. At the low end, the Sena SMH5 has half the range and, while pairing up to 4 riders, can only accommodate one simultaneous conversation. If you want to tie in a two-way radio for greater bike-to-bike range, Sena’s SR10 can connect to most FRS/GMRS radios using a manufacturer specific cable. Go wired or Bluetooth? Both work well to enhance your riding experience. Wired systems can be a hassle to configure, but if you wear earplugs, the earpiece volume is typically louder than with battery-powered Bluetooth systems. Bluetooth is less of a hassle and has many more modern features, but there is a learning curve to operate it. Whatever you choose, be sure to fiddle with it before you set off, and not while riding.